“Interstellar” is the new sci-fi adventure film from director Christopher Nolan (“Batman Begins,” “The Dark Knight” and “The Dark Knight Rises”). With a stellar cast he has crafted a smart science fiction film that uses its estimated $165 million budget to create a world in space that seems as real as a Discovery Channel documentary, rather than to bring giant toys or space creatures to life. The movie is set in the not so distant future and the earth is going through climatic changes. NASA, now a secret government agency, is working on a secret mission to find a new home for the people who are living on the dying planet. Matthew McConaughey is Cooper, a former pilot who’s having a hard time adjusting to his life as a farmer in a world that is desperate for food; not pilots. However the adventurer in him drives him to pursue things in his day to day life that keep his dreams alive of one day being a discoverer. A widower, who lives with his father-in-law and two kids, Cooper tries to instill the same sense of wonder and adventure in his children. After some type of anomaly leads him to the secret NASA headquarters he’s presented with an opportunity to pilot a space ship with a team of adventurers whose mission it will be to find the people of earth a new home. The team has discovered a wormhole near the planet Saturn that will give them a chance to explore new solar systems. Meanwhile, NASA scientists will work on a plan to get all of the people of earth off the dying planet and transported to their new home. However, the wormhole presents a problem. Since the team will travel out of their realm each hour through the wormhole will represent seven years back on earth. They are now in a race against time to find a safe haven before every one back home dies off from old age. Love is what saves the day in this great adventure. I have to be careful not to reveal any spoilers in the movie but trust me; you’ll never see this ending coming. The one drawback of this movie is the length (almost three hours long). I find it difficult to believe that a few scenes couldn’t have been cut to trim it down to closer to two hours, but even with that one small issue, it is still a movie that I recommend. The movie is out in IMAX and regular screen version. Go see the IMAX version! It is spectacular! 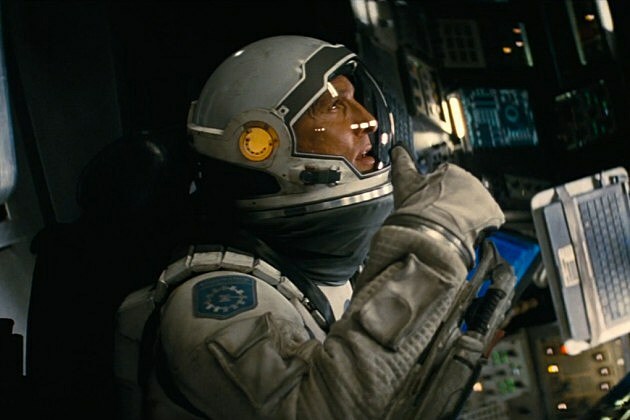 “Interstellar” is rated PG-13 for intense action and some strong language. On my Hollywood Popcorn Scale, I rate it a JUMBO!